Several years ago, you began showing up to our meetings and actions to tell Mayor Fulop you wanted an end to traffic fatalities and dangerous conditions on our roads citywide. 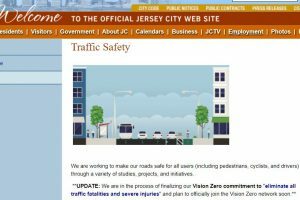 You brought family and neighbors to grow support, and Mayor Fulop finally heard us and committed Jersey City to become the first Vision Zero City in NJ in 2018. 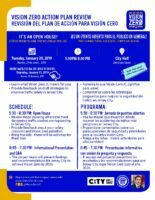 On Tuesday, Jan. 29th, we kick off the Vision Zero Action Plan which will guide the City’s efforts to make Vision Zero a reality. This meeting is a BIG DEAL and we need your participation to make it a success. This plan is a year in the making – its very robust and spans all city agencies. We think you will be encouraged by the scope. But it won’t work without YOU (and your family, and your neighbors…bring ’em!)! Your feedback and engagement are needed to make this plan work. 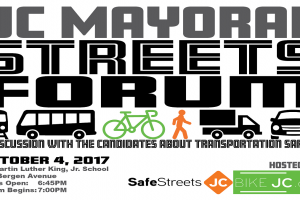 Please join us as Mayor Fulop kicks off the presentation, followed by a Q & A. Kids are welcome! Facebook event and flyer below for sharing. WHERE: City Hall Council Chambers, 280 Grove St.
6:45pm Mayor Fulop kicks off the Action Plan Presentation, followed by Q &A. See you on Tuesday for the big reveal!